Because if you haven't, you're missing out. Can’t decide what to eat? There are tons of food trucks all around campus at any given time. So instead of heading to a restaurant, check twitter to see where a GW-favorite truck is hanging out. Most trucks have handles and tweet where they’re parked for the day. Local favorites Sweetz Cheesecake (@Cheesecaketruc) and DC Slices (@dcslices) have built up a major following. 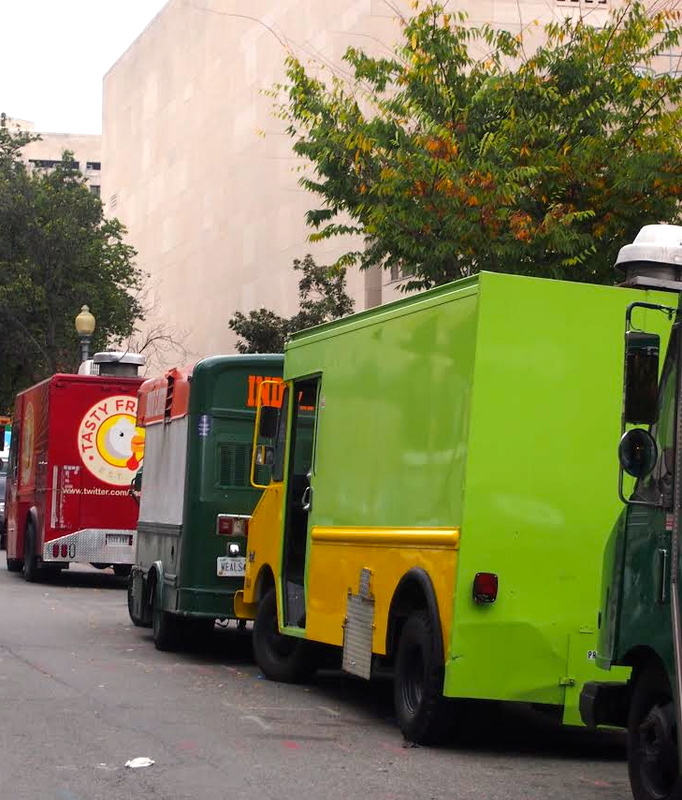 If you’re feeling up for an adventure, 20+ trucks tend to congregate at one time in certain areas like 20th and L and Farragut Square, which are both right by campus, so head there to see which one calls your name. It may seem overwhelming at first but don’t let the variety intimidate you. You can’t go wrong when you decide to hit up the food trucks and it is pretty certain that you will end up happy. Most college students are on some kind of a budget, so finding places to eat that aren’t too expensive is a top priority. The delicious food from the trucks is reasonably priced so students — and everyone else for that matter — are genuinely satisfied. From the popular Big Cheese truck, you can get various types of scrumptious grilled cheese sandwiches for under $10. Turn the corner only to find the truck you were looking for? You’ll have the leftover funds to get that second bite! Counteract that Whole Foods tab you’ve been rackin’ up without sacrificing good food. The local food trucks accept GWorld! This form of payment is new to the trucks and super helpful. Now you don’t have to carry around cash or worry about not having enough money to afford the amazing food truck options. Plus, it’s super easy to double check online that you have sufficient funds on your card while you are in line and add more money to the card if you don’t! So no excuses, get in line. “@itskevin: My very last order. 🙁 Best of luck, guys! #farewellmac @CapMacDC pic.twitter.com/N3MiN0xRNo”- thank you! Okay, maybe not friends for life, but all of the food truck vendors are seriously some of the greatest people I’ve met. It’s obvious they truly love their jobs. They don’t rush you like some cashiers at other establishments and their friendliness isn’t forced like waiters since you don’t tip them. They’ll often remember your order, and that’s when you know you’re legit at this whole food truck thing. You won’t exactly get famous for this good deed but many of the trucks do participate in the various fundraisers of student orgs on campus. The groups promote the fundraiser and then an agreed upon percentage of the profits the truck makes within specified hours goes to the organization to help them raise money. You get to eat delicious food and feel great about helping others by doing it. Don’t worry, calories don’t count when it’s for charity. It’s delicious and often one-of-a kind! The deliciousness that comes from these food trucks is seriously unique. Where else can you find amazing mac and cheese with Cheese-its, a meatball, or chicken parm on top? Or mouthwatering customized ice cream cookie sandwiches? Or dumplings on the go from Yumpling? Eating at the food trucks offers a truly amazing break from the same routine restaurant options around campus. These are only a few of the reasons that food trucks are the clear choice for your next meal. Once you try one, your goal (like mine) may be to try each and every one before graduation. These trucks hang around campus to do more than just omit the smells of frying dough or over-seasoned gyros along H Street. Do yourself a favor and go give ‘em a try.